'Clinical Commissioning Groups' (CCG's) are now opting to privatise other NHS services in the Lancashire area. The NHS cattle market is now open to PRIVATEERS! There's a new cattle market auction over at the Lancashire CCG farm with the auctioneer waiting for the highest bidder, selling off our NHS services with us mere 'service users' locked outside shouting 'it's Our NHS'. Well, other NHS services in the Lancashire area have now 'gone to market' and you guessed it, the NHS bid by Southport and Ormskirk NHS Trust to retain the contract for services such as GP out-of-hours services and walk-in centres; was rejected by West Lancashire CCG in favour of private companies. The West Lancashire CCG remains in talks with United Healthcare and Virgin Care about the contract. The LibCon coalition shake up of the 2012 Act imposed an obligation on CCG's to allow private investors to bid on NHS contracts. The Health and Social Care Act 2012 was the most controversial set of reforms in NHS history - greatly expanding the role that private companies play in delivering health services. 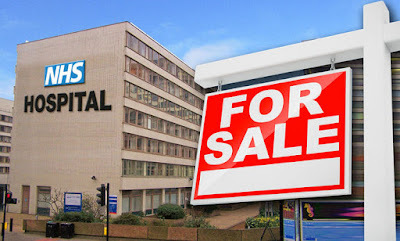 Instead of a publicly funded and publicly owned NHS in England, the Act created a competitive market for health services where the government pays for, but does not provide healthcare. This is evident when we look at the reasons why a failing hospital trust, such as the Lancashire teaching hospitals trust, place a bid to the CCG to run services such as their recently acquired urgent care centres (UCC) at Preston and Chorley. The Lancashire trust had just lost their tariffs for A&E treatments at Chorley after closing it for patient safety reasons, yet the money raised elsewhere still wouldn't cover the budget for running the UCC on the same site. Since the CCG's buy these services they aren't going to invest in a flagging trust that couldn't run a bath! Still, there is no evidence that the Lancashire NHS Trust actually placed a bid to retain the UCC at Chorley, which would have kept the clinic in public ownership. There is also no evidence of any other bids on the contract, which apparently is worth between £32m to £36m. So like the Southport and Ormskirk NHS services, it was put out to pasture and the first and ONLY sniff of a bid was from a private consortium. Some might say that under the circumstances the CCG had no other option but to sell off the NHS services to a 'private' provider. The question is, why is the NHS finding itself in such a position? Are publicly funded services now having to rely on a private provider to take-over those NHS services? If so, we are well and truly on our way to the American 'insurance based' model of healthcare. 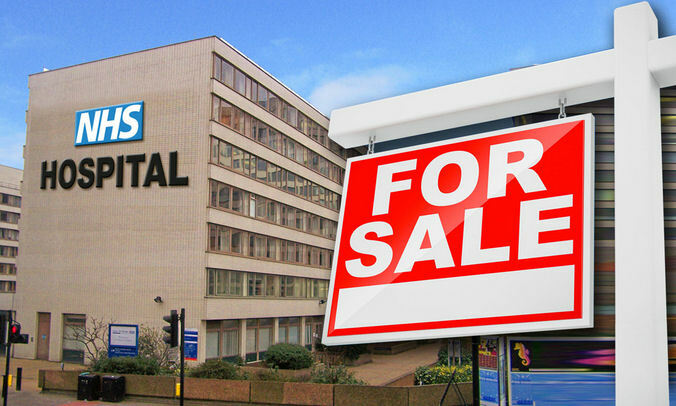 Can NHS privatisation be stopped? Today's politician is vastly different to those around when the NHS first started. Every successive government has tinkered with the NHS to the extent where people are so confused they become 'lost' in how their healthcare system is managed. And when it comes to privatisation by stealth, that plays to the advantage of private healthcare service providers. NHS services begin to become indistinguishable from those provided by a private company. So 'daan saath' in the house if buffoons we have the two main parties of Labour and Conservative who ironically both support private investment in the NHS. Take for example the warmonger Tony Blair who implemented the 'private finance initiatives' (PFI) for NHS reform. Even now, the extensions at Burnley hospital and Blackburn hospital equate to over £ONE BILLION in interest alone over the 35 year deal with private consortium's. It's no wonder the Blackburn hospital A&E temporaily shut its doors to patients in 2008 sending ambulances elsewhere in Lancashire. Money that should have been going towards staff and resources was being eaten up in interest on the PFi deals. It was like having a 50% cut in East Lancs Hospitals budget leaving very little for investment in patient services to alleviate pressure on the Trusts only A&E in East Lancashire. People who sit on the boards of CCG's provide money to the hospital trust they believe they are buying services from. When problems arise at the hospital trust, the trust will notify the CCG who in turn HAVE NO OPTION but to increase their monetary provision to the trust since they have no alternative supplier. It's the same with council tax, YOU can't choose an alternative provider if your bins don't get emptied or you feel the service being provided 'requires improvement'. The governments intention is to run down the NHS to such an extent that filling the gaps with private provision seems the best solution. ■ Is your local hospital under threat of losing some services? ■ Why not leave a comment in the 'Post a Comment' box below. ■ You can also Click Top-Left and Contact me via email, if your posts are any good I'll publish them on here. *Your email and other personal information will not be published.